The Sabre Design Team and Jim Taylor Yacht Design have again joined forces to create a new Sabre sailing yacht. The Sabre 386 was launched in January 2004 and in October 2004 was awarded Cruising World Magazine’s Boat of the Year Award as Best Mid-sized Performance Cruiser as well as Overall Domestic Boat of the Year. Sabre’s attention to detail is well known. Whether it be the style and grace of her shear, the intricate details of a deck tooling blending comfort, safety and good looks, or the details found in the hand crafted interior joinery, Sabre Yachts stands alone in quality and reputation. The Sabre 386 embraces the standards which have put Sabre’s name atop the quality spectrum of boatbuilding for the last 35 years. Current Sabre owners and those who have followed the brand over time, will see details here which make it feel familiar. Details which make sense, which add to comfort, security and well being. 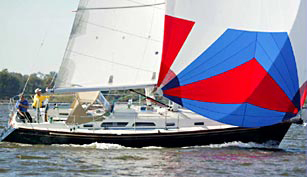 Logical details that, above all, make each Sabre design a great, safe and beautiful sailboat. But details from the past are just part of the story. Keeping up with technology has to go hand in hand with our desire to build the finest possible sailing yachts for our clients. The Sabre 386 hull is built using vacuum bagged, closed cell, cross linked PVC Divinycell foam and structural E Glass, which gives her one of the strongest, lightest, most durable structures available today. Her deck is also cored with Divinycell. Hull lines, underwater appendages and rigs were drawn by Jim Taylor Yacht Design. The deck, deck styling and interior were accomplished by the Sabre Design Team. The result is a yacht which, like her siblings, will establish a benchmark in sailing that will endure for many years to come.